As a whole, HB 7192 deals with fostering cooperation, regional or otherwise, among municipalities, among school districts, and among municipal, regional, and state governments, with the aim of creating efficiencies. I applaud the goal of fostering intergovernmental and regional cooperation, and a number of the initiatives in this bill could well lead to good outcomes–for example, having a commission “consider, analyze, and make specific recommendations” for joint purchasing among municipalities, opportunities for the use of e-government solutions, standardization, enhancement, or streamlining of reporting by various levels of government. I would also like to call attention to Section 21, which would allow two or more municipalities to override their charters or local ordinances for the purpose of jointly performing functions that they could perform separately. The municipalities in the Western Connecticut COG have called for such a provision, because it would facilitate the voluntary, elective sharing of services among municipalities, and I support it. But overall, I am concerned that the goal of this bill seems based on a questionable premise. That premise is, that local governments and school districts are not generally inclined to share services or regionalize functions and must be either forced or incentivized to do so. For example, Sections 15-20, which requires municipalities to consolidate their tax assessment functions at a regional level, and Sections 22-24, which requires 60 towns to consolidate their emergency dispatch operations, would impose penalties for non-compliance. This suggests that local governments and districts would not share these services if existing obstacles could be removed. This committee, as well as the Education Committee, has heard multiple testimonies that demonstrated the contrary. In the case of emergency dispatch operations, for example, many town executives have cited current binding arbitration rules that have kept them from moving forward on sharing operations. Reforming binding arbitration and taking measures like the one described in Section 21 of the bill would be a far more constructive, easier, and more efficient way of fostering cooperation and sharing than requiring action and imposing penalties for non-compliance. These sections, which mirror Sections 1-4 of SB 874, also a governor’s bill, which has already been heard by the Education Committee, would create the “Commission on Shared School Services (COSSS) to develop a plan for the “redistricting or consolidation of school services and school districts”. Lest there be any doubt that the COSSS’ scope includes recommendations for changing the configurations of school districts, the terms “redistricting” and “school consolidation” are used repeatedly throughout these sections. Also noteworthy is the reference on page 22 of Governor Lamont’s budget book, which was released in mid-February before any public comment on this bill had been received, to a “School Services and Redistricting Commission”. The focus of COSSS’ work appears to be on cost savings and operational efficiencies, with little or no consideration for the quality of education overall. Learning and student outcomes should be our primary focus when making changes to the educational system. Many school districts would like to share services, and many, many have. Often, however, they are prevented from doing so because of costs, collective bargaining agreements, or various mandates. There are also cases where statewide legislation has passed to encourage sharing of services, but progress has been impeded by the same factors. For example, Governor Lamont has recently highlighted North Carolina’s single statewide contract for school software. In 2017, we actually passed a bill (HB 7276, which became PA 17-220) that required the state to survey local and regional boards of education on their use of digital school management and reporting software, with a view toward eventually providing a statewide option at no cost to districts. We wanted to make that language go farther –to require the state to issue an RFP and to work toward a contract. But the state’s fiscal constraints would have prevented such a provision from passing. That constraint remains today. The bill is silent on the ultimate fate or purpose of the COSSS plan. Would it require legislative approval to be implemented? Would it, or part of it, be subject to state Board of Education approval? Would penalties for non-compliance with any part of the plan be allowed? Would school districts be able to choose what recommendations to follow? Is the plan simply an exercise in identifying voluntary opportunities for action by school districts. The uncertainty created by the silence on the purpose of the plan is exacerbated by the length of time (nearly two years)the COSSS would be given to deliver it. 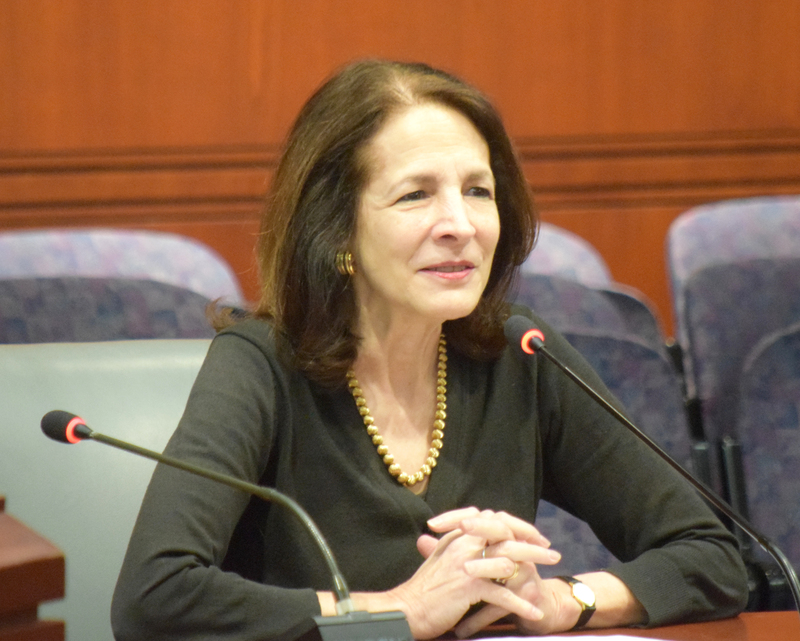 Knowing that the configuration of the state’s school districts could change two or three years from now does not inspire confidence among prospective residents of Connecticut towns. I believe the legislature has a role to play in identifying and eliminating barriers to voluntary consolidation and sharing of services, and in identifying opportunities that local districts and governments may not have thought about. With a few exceptions, that is not the thrust of this bill, so I cannot support it. Thank you for your thoughtful consideration.